Summary: For the second consecutive time Ontario’s carbon market has witnessed a fully subscribed auction. The auction, which took place last week, cleared 25,296,367 allowances in the current auction with a subscription ratio of 1.22. The current vintage credits cleared at a settlement price of CAD 18.72, CAD 0.52 above the auction reserve price. The advanced auction also showed positive results with a subscription ratio of over 50% and clearing at at the auction reserve price. Still very much in its infancy, the positive results released today indicate that Ontario’s carbon market is in full swing with healthy demand for allowances. 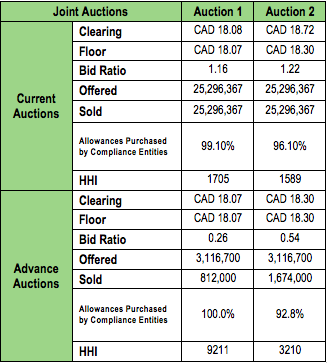 Building on Ontario’s first carbon auction in March, the June auction enjoyed a premium of CAD 0.64 to the program’s first auction. Due to an inflated exchange rate and a floor tied to that of the WCI, Ontario’s Auction Reserve Price rose to CAD 18.30 prior to last week’s auction. With positive market sentiments felt in the market, a repeat auction sell-out was well anticipated by many on the market. Based on CaliforniaCarbon.info’s analysis, Ontario’s stand alone market will have an annual surplus of 1.2 million allowances should the remaining two auctions of the year also clear. With the declining cap, however, emissions are projected to transcend the number of allowances as early as next year. 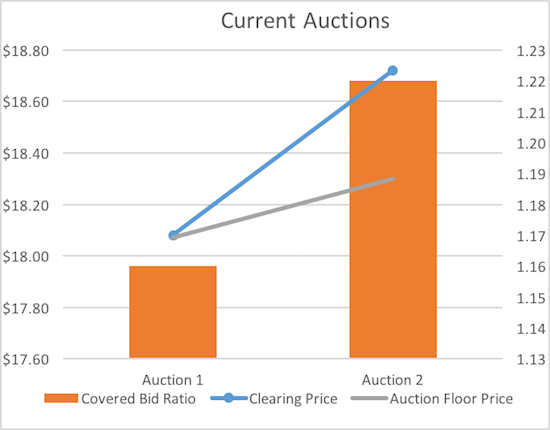 Unsurprisingly, participants have shown a strong tendency to obtain allowances in this year’s auctions before the Auction Reserve Price rises to meet next year’s floor price and prices on the secondary market follow suit. The anticipation of linkage with the WCI continues to sustain the Ontario Carbon Allowances (OCAs) to the Californian Carbon Allowances (CCAs). Based on the exchange rate used at time of auction, the OCA cleared at a premium of USD 0.08 to WCI’s clearing price in last month’s auction. 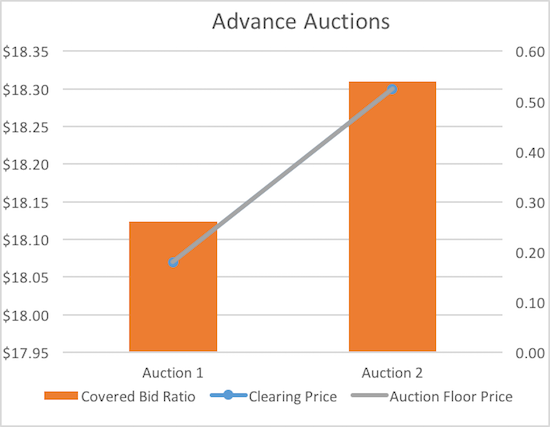 The advanced auction showed positive improvement from the previous auction with a subscription ratio of 0.54. The rise in interest in future instruments indicates to the positive market sentiment with traders willing to hedge on future options.